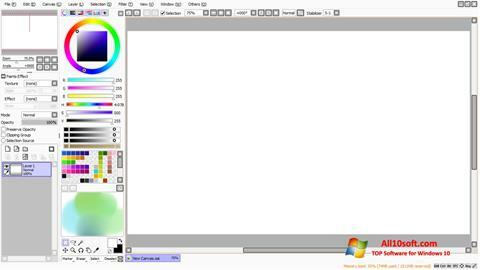 Paint Tool SAI for Windows 10 - a system for drawing and image processing with support for graphic tablets. The program uses vector and raster layers, provides fast rendering and smoothing, interpolation of strokes, includes markers, brushes of various sizes, functionality for emulating watercolors, oil paints. Recognizes the degree of pressing and the thickness of the lines, contains a set of graphic elements, means for selecting sketch objects. Allows you to create or load third-party textures of hosts and tools, uses keyboard control profiles from Photoshop, supports scaling layers. You can free download Paint Tool SAI official latest version for Windows 10 in English.